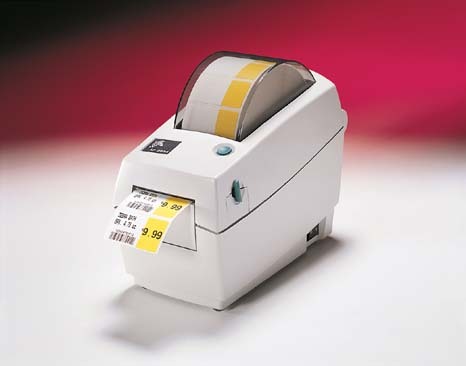 The ultra-compact direct thermal LP 2824 Plus™ bar code label printer brings powerful performance to applications requiring a space-saving printer and media widths of 2.2 inches/56 mm or less. It includes a 32-bit RISC processor for faster formatting and first label out, an auto-sensing serial port, and co-resident EPL and ZPL programming languages. Available options include additional memory, 10/100 Ethernet, label peeler, and receipt/label cutter. The LP 2824 Plus is simple to set up with the intuitive Zebra Setup Utilities software. And it’s easy to use with an OpenACCESS™ design and clear media window for simple media loading and monitoring, color-coded user-guide touch points, and instant reset button. Serial, parallel, and USB interfaces, plus networking option, ensure easy system integration for a wide range of applications. Supplies Maximum label and liner width 2.36" (60mm) 1.44" (37mm) with Media Adapter Guide Minimum label and liner width 1.00" (25.4mm) 0.585" (15mm) with Media Adapter Guide Maximum label and liner length 39" (991mm) Maximum label and liner length (optional) 39" (991mm) Maximum roll diameter 5" (127mm) Core diameter 1.0" (25.4mm) and 1.5" (38mm) Media thickness 0.003" (0.08mm) to 0.007" (0.18mm) Media types (black-mark optional), black bar, black mark, continuous, continuous receipt, die-cut, gap, fanfold, linerless, notch, notch sensing.